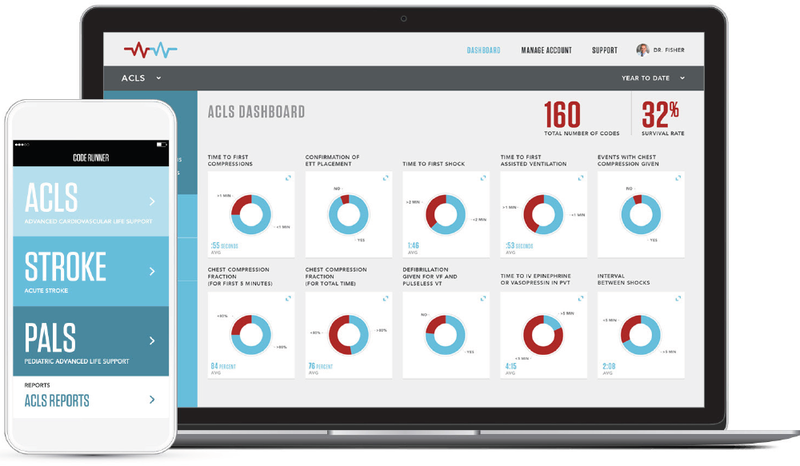 The ACLS module of the Code Runner platform is specifically designed for adult ACLS code management with mobile real-time documentation and clinical decision support, as well as access to the web-based reporting tools and analytics suite. Code Runner provides step-by-step clinical algorithms for ACLS based on the current clinical guidelines. As care is administered, simultaneous documentation is achieved by a simple tap. As interventions are performed and medications are administered, the Code Runner Clinical Decision Support (CDS) updates the potential next steps so caregivers can ensure the best outcomes for their patients. Not all ACLS codes are the same. Quickly switch between: Pulseless Ventricular Fibrillation / Tachycardia, Pulseless Electrical Activity / Asystole, Unstable Bradycardia, and Adult Tachycardia; or select between various Cardiac Rhythms: Atrial Fibrillation, Atrial Flutter, Asystole, Normal Sinus Rhythm, Sinus Bradycardia, Sinus Tachycardia, Supraventricular Tachycardia, Torsades de Pointes, Ventricular Fibrillation, and Ventricular Tachycardia. Each choice and changes the algorithm so that our Clinical Decision Support (CDS) provides you with the latest guidelines. Immediately transfers your code data from your mobile application to your web interface. The webapp offers a suite of reports and data analytics that allows authorized users to document, review, and examine key metrics. All necessary data points for participation in national programs, such as Get with the Guidelines®, are captured. Users can utilize these key data points to focus on benchmarking, quality improvement, provider training, and beyond!